Austin City Council has approved four recommendations intended to support safer street designs and traffic speeds on city streets. Only two members voted against the package — one who was spending his last day on the dais after defeat in the November election, and another who said that most people in her district rely on cars, according to the Austin American Statesman. But the comprehensive speed policy reform package could actually be very beneficial to residents of car-dependent areas of Austin, who suffer a much higher risk of crashes and traffic death than residents of most large American cities. Houston, Dallas, San Antonio, and Phoenix suffer almost twice the rate of traffic deaths per 100,000 residents as the rest of the ten largest cities in the nation, according to the Houston Tomorrow report “Toward a Vision Zero Action Plan for the City of Houston.” In 2013, Austin was about as dangerous as Houston, with 8.3 traffic fatalities per 100,000 residents, then in 2015 traffic fatalities spiked to a rate of 12 per 100,000 residents, higher than any of the largest cities in the report. In most Texas cities, streets are designed and speed limits are set in a way that leads to dangerous speeding. The street designs encourage drivers to go too fast, then police and EMS are asked to clean up the mess. Houston changed its policies to allow for safer street designs and speed limits, but the city isn’t allowed by state law to design streets for speeds lower than 30 mph. To make streets truly safe, cities need to be able to go farther than that and implement street designs 25 or 20 mph. Safe design speed might entail highly visible interventions like traffic circles, bulb-outs, and raised crosswalks, or subtler changes like narrower traffic lanes and tighter corners. Support legislative efforts to lower the default speed limit to 25 mph. Incorporate target design speeds into plans & manuals. Systematically evaluate arterial speed limits citywide to see where adjustments are appropriate. 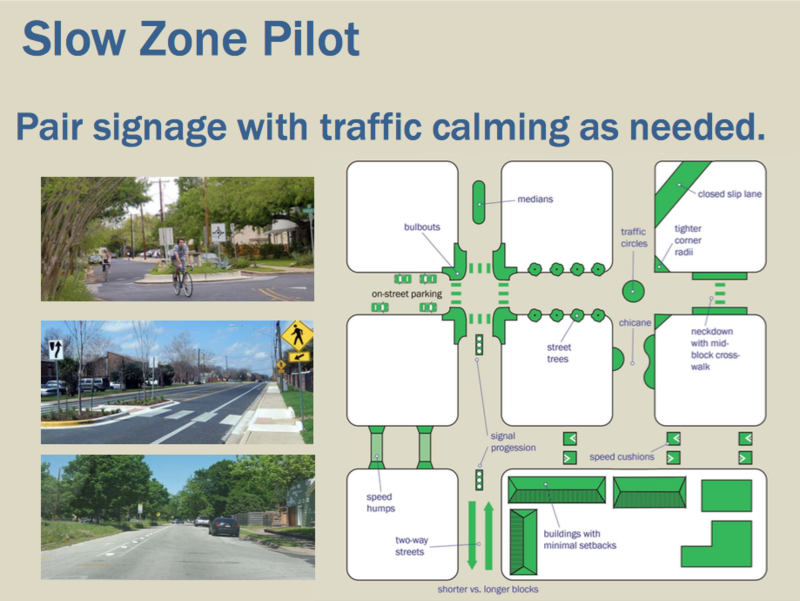 Establish a “neighborhood slow zone” pilot. Many American cities are now establishing safe, modern speed policies as a result of a data-driven approach to reducing traffic deaths. While the statewide effort to change default speed limits is focused on residential neighborhood streets, the Austin Transportation Department seems to be rethinking speed limits and street designs everywhere in the city. After a driver hit and seriously injured a young boy, Ben Sears, on his neighborhood street in the Mueller development, safe streets advocates asked the City of Austin to establish slow zone pilot areas. The Austin Transportation Department wants to use various traffic calming measures in these slow zones. However, the city is currently limited by state law to setting a minimum speed limit of 25 mph. To address this, the bill to change the statewide default limit to 25 mph would also change the speed limit cities are allowed to use in such slow zones to 20 mph. A decade from now, Austin residents and visitors can expect a much-improved level of safety for all modes of travel, because these recommendations call for incorporating design speeds into plans and manuals. These documents have long-term impacts on the city. As the city updates its Strategic Mobility Plan and its Transportation Criteria Manual over the next year, it will be instructing engineers on the city’s priorities for the next few decades. Those priorities will include reducing traffic deaths by achieving safer speeds. City Councilwoman Ann Zadeh is leading the charge in Forth Worth to make neighborhood streets safer through better design and lower speed limits.